Best experience ever. I feel very secured and have privacy because the curtain and the room. The staffs(i meet four maybe) at the counter are all nice and willing to help you. Though the room is kind of small, it is big enough for me. Not a very social place but you can have a small and deep talk with your roommate which I prefer more than with a bunch of people. Probably the best hostel I have stayed in my life! Amazing location, comfy and private beds, awesome view to the sea, nice staff... I absolutely loved my time in Zadar! The room is new and cleanliness. The bed is comfortable and with curtain that gives me private space. In a 4-mix room, there has one toilet and one bathroom, very convenient! And the reception is 24 hours. Nice place to stay in Zadar. Delighted to have stayed here. Made our trip to Zadar so pleasant and easy. We were nervous getting a bus from the airport at midnight as 3 females but it was so simple. Such a safe place. Hostel is the ideal location! This was the best hostel I've ever stayed at. 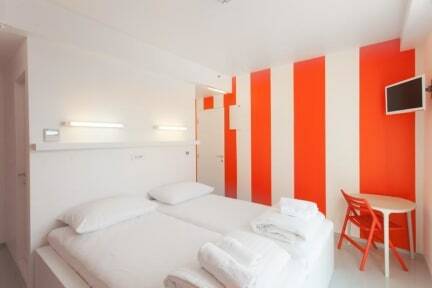 There was absolutely nothing I didn't like about this hostel. I loved the privacy that the beds offered, the breakfast in bed in the mornings, the location was impossible to beat, the views of the forum from my room, and the friendly staff who great you whenever you come in the front door. I could not recommend this hostel highly enough. I would come back to Zadar just to stay here again! Fantastic location and friendly staff. Only the room was a bit small and not very sound proof. Pro: Location: The hostel was very easy to find and located right inside old town. Staff: the gentleman at the front desk was wonderful. He made every effort to make me feel welcome and looked after my every need. Con: the hostel is across the street from a church so the bells ring a bit early but it’s not too bad. Everyone in the hostel seemed to 40+ Not Really a con but everyone in my room went to bed at 8:30 so I felt bad to move around and make noise. Overall amazing!! Great place to stay, but not a great place to meet people if traveling solo. Also, the wifi was horrible In our room. The beds we're very comfortable and clean. 4 people shared a bathroom which was nice. They also bring croissants to your bed for breakfast. Overall good place to stay. Location is fantastisc and the view from the bed is 5*. The bathrooms are super tiny, only wished the soap was restocked regularly. There's not much of a social atmosphere, they don't do much activities as a hostel. Wifi is good especially for work, Daniela, Andrea, and the morning shift gal were super helpful when I had to prep and have a quiet place so I can have Skype meetings for work. Thanks you so much! I'll be definetely returning next time I'm in Zadar!